Battery charger with microcontroller for reliable protection from overcharge. Very short recharging time, max 2 hours. 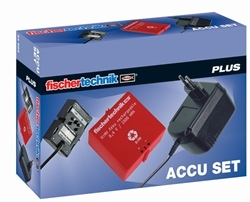 High-powered NiMH Accu Pack with short-circuit protection, 8.4V/1500 mAH. 120V~/60Hz.